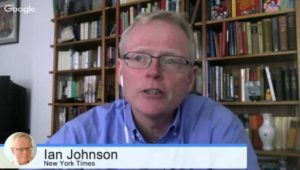 Ian Johnson, a veteran journalist with a focus on Chinese society, religion and history, is the 2016 recipient of the Shorenstein Journalism Award. The award, given annually by the Walter H. Shorenstein Asia-Pacific Research Center, is conferred to a journalist who produces outstanding reporting on Asia and has contributed to greater understanding of the complexities of Asia. He will deliver a keynote speech and participate in a panel discussion on May 1, 2017, at Stanford. Ian Johnson is a speaker at the China Speakers Bureau. Do you neeed him at your meeting or conference? Do get in touch or fill in our speakers’ request form.